Beauty & the Beast is one of my favourite family movies of all time. 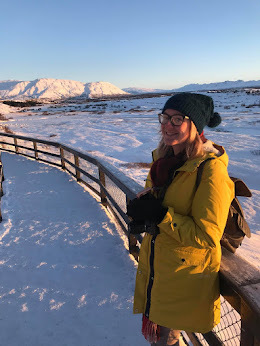 It is one that I love watching and singing along to with the kids and until now was seriously lacking in related merchandise. 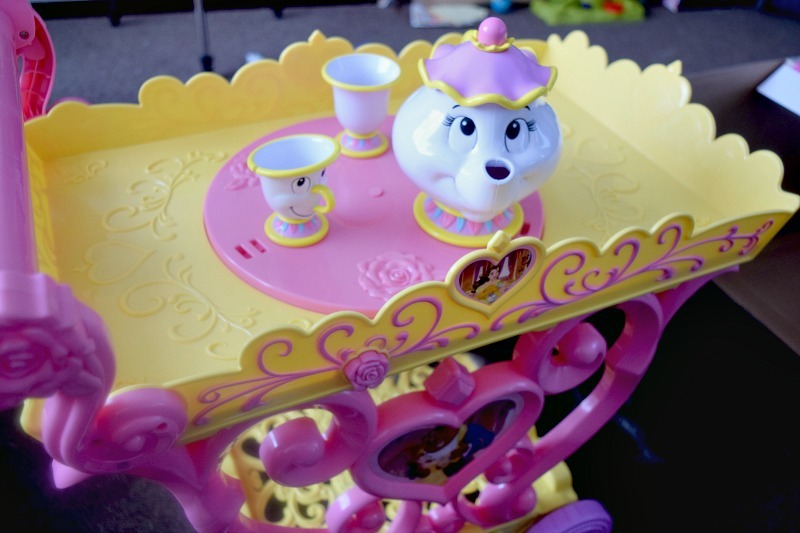 Jakks Pacific have recently released a 'Disney Princess Belle Musical Tea Party Cart'. This means that new fans get to play with two of the films most iconic characters during role play and us older fans get to buy our children a toy that fills us with nostalgia. The tea cart comes with Mrs Potts, Chip (everyone's favourite cup) and another cup, which unfortunately has no face! 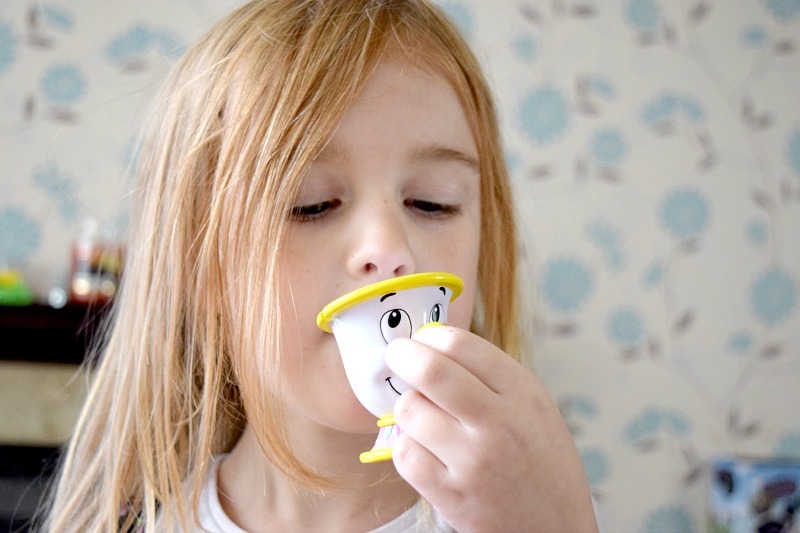 It also comes with an invitation to Belle's tea party, which can be personalised. 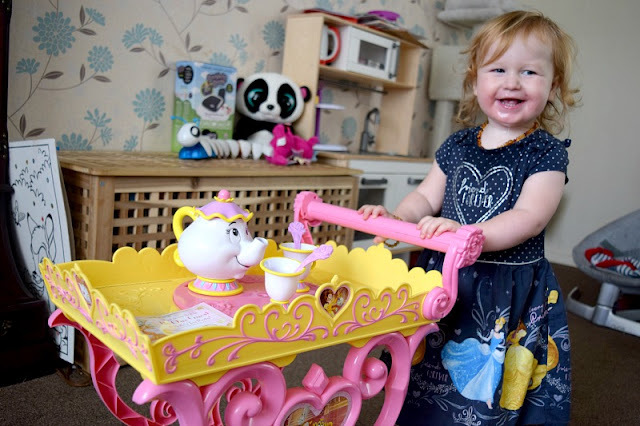 The tea cart is easily put together and with the push of a button, plays 'Be Our Guest' whilst spinning Mrs Potts and her infant cups. It is so cute and the children absolutely love it. My only gripe with the tea cart is that it plays the same section of the song on loop over and over, this is mainly annoying when you have children who know how to switch it on when you sneakily turn it off for a few minutes peace. It would have been amazing if they had added more of the song or even added Mrs Pott's 'Tale as old as time' - my favourite song from the movie! My children love imaginative play. They play lots with their toy kitchen and regularly play tea parties together so I know that this toy is not wasted on them. It gives them more angles for stories when playing tea parties together, for Elsie it has given her a new found love of noisy toys and it is something that has completely taken the interest of all three of my children despite the difference in age, gender and interests. For me, I love watching the children enjoy something that I grew up with. I would love to see the range expanded, if they made a child friendly enchanted rose with music and lights... I would be all over that! (take note Jakks Pacific). You can see Belle's Musical Tea Party Cart in action in our video below. Please do give it a thumbs up if you like as I love making our video demos. Belle's Musical Tea Party Cart is available to buy online and in all good toy retailers. Prices differ so do shop around.